The Rialto Square Theatre and Next Media radio stations will host "The Coolest Auction Ever!" this week. One of the items, a "glass sculpture" autographed by Tommy Chong, is being auctioned on ebay. The proceeds from this item will be used for the restoration of the theatre. This scultpure has been disabled for any other use than as a collectible for display. U.S. Attorney Mary Beth Buchanan, the person responsible for wrongfully persecuting Tommy Chong to boost her career, is currently being investigated for her role in the wrongful firing of eight U.S. Attorneys. She says that she prosecuted Chong because Chong Glass sold "drug-cutting agents, not just bongs and other items sometimes cast as the harmless mind-your-own-business paraphernalia of lone pot smokers. All the costs were paid for by assets forfeited by Chong's business, she said, refuting claims by critics that the prosecution cost taxpayers millions of dollars." You have to ask yourself...of all the people that were arrested for Operation Pipedreams, how come Tommy Chong is the only person that was sent to prison. Update: "In stories April 26 and 27 about U.S. Attorney Mary Beth Buchanan, The Associated Press reported erroneously that a company owned by comic Tommy Chong sold substances used to "cut" or dilute illegal drugs. Chong's company was one of several Buchanan's office prosecuted for selling illegal drug paraphernalia, but it did not sell drug-cutting supplies." In an interview with The Telegraph newspaper, Tommy Chong says he's working on a "Cheechless" Cheech and Chong film. The film is about Chong "mistaking a man, played by Paul Power, a storyboard artist from Australia, for Cheech." Chong and Power will co-direct the project. As far as why the reunion didn't work out, “I think he remembered why he was mad at me before — I hadn’t changed a bit." This weekend, Tommy & Shelby will be at the Argosy Casino in Alton, Ohio. From June 8-10, NORML will be hosting the 2007 Aspen Legal Seminar. On June 9th, Tommy Chong will be NORML's featured luncheon speaker. "Tommy, as you may recall, was selectively prosecuted by the federal government a couple of years ago for selling pipes on the Internet, for which he ended up serving nine months in prison. His topic for the seminar is titled Why Pot Is Still Illegal and Why Dave Is Still Not Here. This experience has clearly left Tommy feeling a renewed sense of urgency for the need to legalize marijuana and stop arresting responsible marijuana smokers." The Rialto Square Theatre and Next Media radio stations will host "The Coolest Auction Ever!" this week. Proceeds will benefit the Rialto Square Theatre Capital Campaign to Polish the Jewel of Joliet. Starting at 5:30 a.m. Monday and continuing through noon Saturday people may go to the Rialto or Next Media Web sites to get the link to eBay to view and bid all items. Web sites are: www.rialtosquare.com; www.star967.net; www.wccq.com; www.wjol.com or www.wrxq.com. "The Coolest Auction Ever!" will consist of autographed memorabilia from stars that have performed at the Rialto Square Theatre as well as memorabilia from celebrities that have been interviewed on the Next Media radio stations. "What makes this cool (hence the name) on many different levels is that we are opening our auction to everyone around the world," said Randy Green, Rialto Square Theatre general manager. "Artists who perform at the Rialto have fans in every corner of the world. Our auction of memorabilia signed here at the Rialto reflects the support these artists have made to our cause and their fans can benefit from receiving this authentic autographed item and the Rialto benefits from their purchase." Just a few of the auction items include autographed guitars from The Goo Goo Dolls, Buddy Guy, George Jones and The BoDeans; autographed bar stools from Ron White, Bill Engvall and Brian Regan; Chicago Bears autographed merchandise; autographed CDs, posters and photographs; an autographed chain saw from Leather Face; and an autographed bong from Tommy Chong. A kick-off party will be held from 5:30 a.m. to 7 p.m. Monday at the Rialto Square Theatre, 102 N. Chicago St., Joliet, IL. All of the items in "The Coolest Auction Ever!" will be displayed throughout the Rotunda, and people are encouraged to stop by the Rialto to view and bid on them. On-air DJs from Next Media radio stations will host their radio shows live at the Rialto. Mary Beth Buchanan, the Bush-appointed U.S. Attorney that prosecuted Tommy Chong, may be in trouble. The House Judiciary Committee wants to question her over what role she may have played in deciding which U.S. attorneys got fired, allegedly for partisan reasons. Meanwhile, Nelson Cohen, US Attorney in Alaska, may soon lose his job. Buchanan used her connections and a part of the Patriot Act, which allowed interim U.S. attorney appointments to become permanent without Senate approval, to get him that job. Congress is trying to remove this provision from the Patriot Act. Buchanan "pushed the White House agenda, prosecuting such targets as famed cinematic pothead Tommy Chong, of Cheech and Chong fame, for selling bongs over the Internet. She also went after pornographers in California." Last week at the Pico House Gallery in Los Angeles, Cheech Marin announced he is donating fifty sets of high-quality digital prints of his Chicano art to various museums and universities. Drug reformer Dean Beacker's Drug Truth Network has posted a 6 minute video on YouTube. 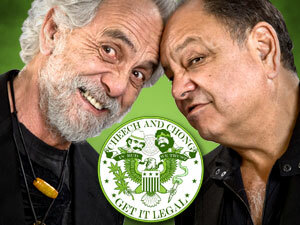 The video features Tommy Chong and others. The paperback version of Tommy Chong's best-selling book, The I Chong: Meditations From The Joint will be released by Simon & Schuster June 5th. There is no new material, only a new cover. We haven't decided if we're going to carry it. To order the hard cover version click here. Our price is lower than Amazon. When Will The Tommy Chong Book On Cheech & Chong Be Released? Tommy Chong is currently writing a tell-all book on Cheech and Chong. No release date has been set, but we should see it sometime during Summer 2008. It's being published by Simon & Schuster, the same company that published last year's New York Times best-seller, The I Chong: Meditations from the Joint. Tommy has a title in mind, but he's keeping it top secret. VH1 Latin America has announced that Up in Smoke is one of its latest acquisitions due to hit its 2007 schedule from May. Director of programming for VH1 Latin America Dean Broadhurst said the channel "continues to seek out and identify original programming that is reflective of pop culture, yet diverse enough to differentiate us from the other entertainment options in Latin America." On May 4-5, Cheech Marin will be bringing his Cheech Marin and Friends "Up In Jokes" show to John Ascuaga's Nugget in Sparks, Nevada. Bret Ernst (Vince Vaughn stand-up tour). 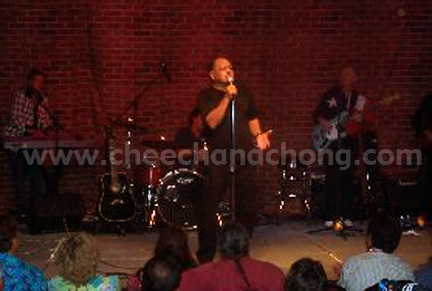 And, of course, Cheech will be telling jokes and performing Cheech and Chong classics with the house band. The show starts at 8 p.m. Tickets are $59 at (800) 648-1177 or 356-3300 or visit janugget.com. Tonight, the Starz channel will debut a new program called the The Bronx Bunny Show. The show is a hilarious, cutting-edge talk show which features two foul-mouthed furry animals - Bronx Bunny, the star-struck title character, and his cranky sidekick Teddy T, the politically incorrect panda. The duo, who recently moved from the Bronx, invites celebrity guests into their crummy East Los Angeles TV studio/apartment where they run a low-rent uncensored public access show. It airs every Wednesday at 11:45PM. Tommy Chong and Harland Williams will be guests on May 16th. Check your local cable guide for the location of the Starz channel. Greenville, S.C. — Kevin Costner, George Lopez, David James Elliott, Greg Kinnear, Joanna Krupa, Catherine Bell, John Elway, Wayne and Janet Gretzky, Jim Rice, Kevin Sorbo, Cheech Marin, Josh Kelley, Javier Colon, Darius Rucker, Mark Bryan, Edwin McCain, Brett Hull, George Rogers, Tom Dreesen, David Mobley, Ben Wright and Jennifer Mills are the celebrities that are scheduled to compete in this year's BMW Charity Pro-Am at The Cliffs golf tournament. Famed international golfer and Grand Slam winner Gary Player will play as a pro. The 2007 BMW Charity Pro-Am at The Cliffs golf tournament will be played May 17-20, 2007, at The Cliffs Valley, The Cliffs at Walnut Cove and The Cliffs at Keowee Vineyards golf courses. All four rounds will be televised live by the Golf Channel. The BMW Charity Pro-Am at The Cliffs is the only tournament on the Nationwide Tour where amateurs and celebrities are grouped with Nationwide Tour professionals in a three-day better-ball competition. Amateurs, celebrities and pros will rotate between each of the three courses on Thursday, Friday and Saturday, with the 14 lowest scoring pro-amateur/pro-celebrity teams advancing to play Sunday's final round. Celebrities will play once at each course on Thursday, Friday and Saturday. Along with a brand new BMW X5 Sports Activity Vehicle, the professional winner of the overall 72-hole event will take home $117,000 from the total purse of $650,000, which is one of the largest purses on the Nationwide Tour. Amateurs and celebrities will compete for individual prizes and cash donations to the charity of their choice out of the beneficiaries selected by South Carolina Charities, Inc. The first six tournaments have raised more than $3.7 million for 80+ area charities. General Admission tickets for the 2007 BMW Charity Pro-Am at The Cliffs can be purchased for $25 through one of the 20 selected charities or by calling (864) 297-1660. Tickets can also be purchased in the Upstate at area Arby's restaurants beginning in March. Children 14 and under are admitted free when accompanied by an adult. Corporate sponsorships and ticket packages that include VIP and Clubhouse tickets can also be purchased by calling (864) 297-1660. For more information on the BMW Charity Pro-Am at The Cliffs golf tournament; sponsorship opportunities, charitable funding or volunteer opportunities, call (864) 297-1660 or visit the tournament's website at www.bmwcharitygolf.com. This past Saturday night at the 10th annual Sonoma Film Festival, celebrities were on-hand to pay tribute to Pixar founder John Lasseter. The event was hosted by John Ratzenberger. It featured speeches from Bonnie Hunt, Glen Keane, Cheech Marin, Tony Shalhoub, Andrew Stanton and Robin Williams. At times, it seemed like a roast with people such as Robin Williams poking fun at Lasseter for his involvement with Happy Feet. We have a brand new t-shirt in stock. The Cheech & Chong Sand Ringer tee is beautiful. Cheech In New Disney Film? According to Cinema Blend, Disney is working on a live action talking animal film named South of the Border. The film stars a female Chihuahua that gets lost in Mexico. It's pure speculation at this point, but it seems likely that Cheech Marin would be involved in such a movie. What is legendary actor, Tom Skerritt, up to nowadays? Skerritt, 73, who many of you remember from such movies as Cheech and Chong's Up In Smoke (Strawberry), M*A*S*H and tv shows like Picket Fences, runs a film school and is currently working on a few scripts. The following article in the Seattle Times interviews Tom about his career, family and his newly adopted hometown of Seattle. Cheech and Chong Dot Com correspondent, Bobby Capps, provided commentary on Friday’s Cheech Marin & Friends, Up in Jokes show in Colusa, California. Hold the harvesters folks! 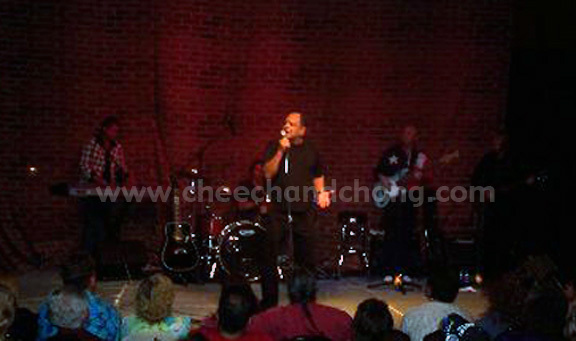 The tiny farm community of Colusa, California hosted a night out with Cheech Marin and Friends. Colusa Indian Casino is located 70 miles North of Sacramento. Colusa isn’t well known for its night life so many of the comedians asked, "Where are we again?" Cheech joked about the local farm community (750+ were on-hand) and their nighttime activity with sheep. That’s right, sheep! Cheech, along with three entertaining friends, were a better hit than any 20th century homemade bong could give you. The crowd was non-stop laughter and wolf howls. Cheech made fun of everything from his recent divorce to his days of old Cheech and Chong music. Second up was Loni Love. The gorgeous plus-sized black woman laid down the law about racial innuendo and middle eastern problems. Loni made reference to the Michael Richards comedy fiasco. She said, "Michael is my friend. He ain't No Racist! You know what? He ain't no comedian either!" Last up was the one name comedian “Sebastian.” The style was slow jam comedy and the crowd seemed to slide into a snooze fest. Between each act, Cheech livened it back up with well-known songs such as Mexican Americans, Me and My Old Lady and closed the show with Born in East L.A. The bad part of the night was where I had to be escorted to my seat by the Colusa Casino hostess (see photo, this photo is on my fridge). Boy, the things I do for the world of entertainment. lol. All-in-all the show must go on and was well worth seeing. As always, Cheech was in great form and we had a good time. The Cheech and Chong "Framed" t-shirts are now available in 2X and 3X, as well as the previously existing M and XL. Last Saturday, Cheech Marin and other celebrities participated in a game of celebrity poker. The event was part of the week's Vegas Grand Prix festivities. Poker gerat, Todd Brunson, was the winner. Other celebs on hand were Jeremy Ratchford, Mimi Rogers, Liz Lieu, Andrew Niccol and his wife Rachel Roberts, NFL stars Ray Lewis , Jack Trudeau, and Elston Ridgle. Just a reminder that Cheech Marin's traveling comedy tour, Cheech Marin & Friends Up In Jokes, will be in Colusa, CA, tomorrow April 13th. Cheech Marin hosts the event which includes a number of great comedians. Cheech will also perform some classic Cheech and Chong skits and perform Cheech & Chong favorites such as Born in East L.A.
Last year, Marin hosted the Comedy Central special Cheech Marin & Friends: Live from South Beach," which premiered on March 13th 2006. The event takes place Friday, April 13th at the Colusa Indian Bingo Casino. Tickets are on sale now. News Review interviewed Cheech regarding this Friday's show. 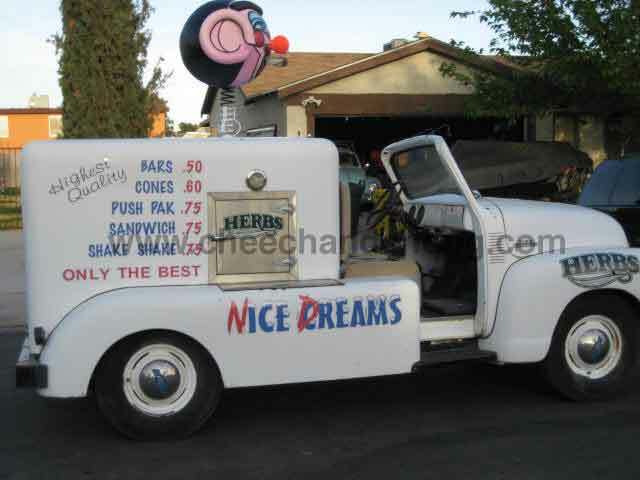 In it he says "I'm very happy to leave Cheech and Chong where it is. I like to leave a good-looking corpse." He goes on to say that he and Chong were "kind of the foot soldiers of the cultural revolution." 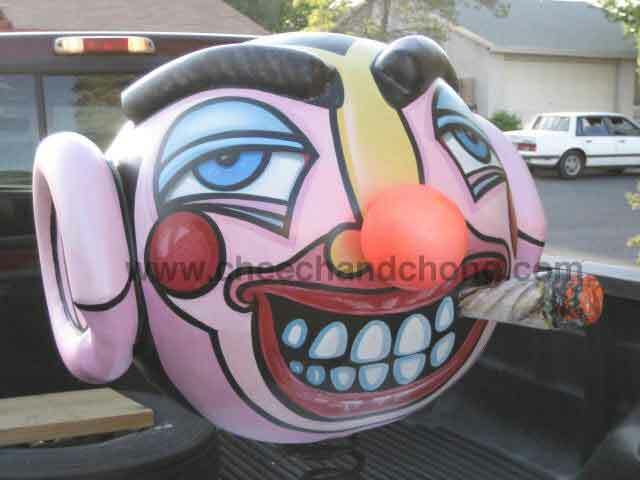 He also discusses his Chicano art collection. Cheech Marin will be participating in a game of celebrity poker this weekend in Las Vegas, Nevada. The game, which takes place at Binion's, is part of this weekend's Nascar events. It's unknown at this time which other celebrities will be participating. Grindhouse, the new film directed by Quentin Tarantino and Robert Rodriguez, opens Friday. Cheech Marin is in one of the fake movie previews during the intermission. The fake movie is called Machete. He is a gun-toting priest vigilante. It co-stars Danny Trejo. Memorable quote..."God forgives, I don't." Robert Rodriguez and Cheech first worked together during the filming of 1995's Desperado. Correction: The Machete preview actually occurs just before Planet Terror begins. Rodriguez may actually turn Machete into a real film. Grindhouse is one of the best films we've ever seen. Over three hours of non-stop action. 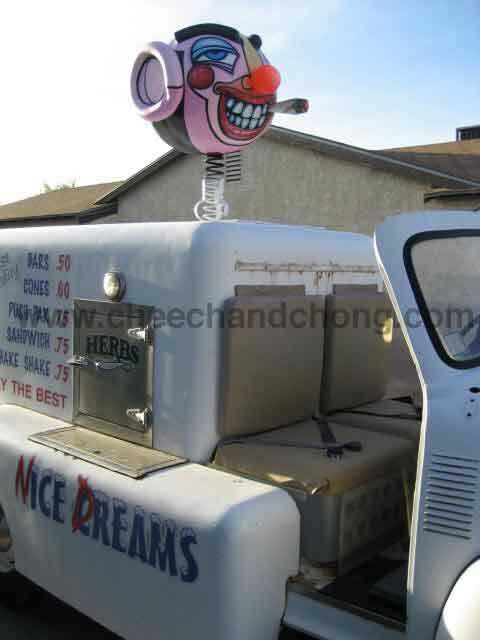 The people at Fat Daddy's Ice Cream of Las Vegas have built a reproduction of the legendary 1955 ice cream truck (bobbing clown head and all) from Cheech and Chong's film, Nice Dreams. These photos are a Cheech and Chong Dot Com exclusive. 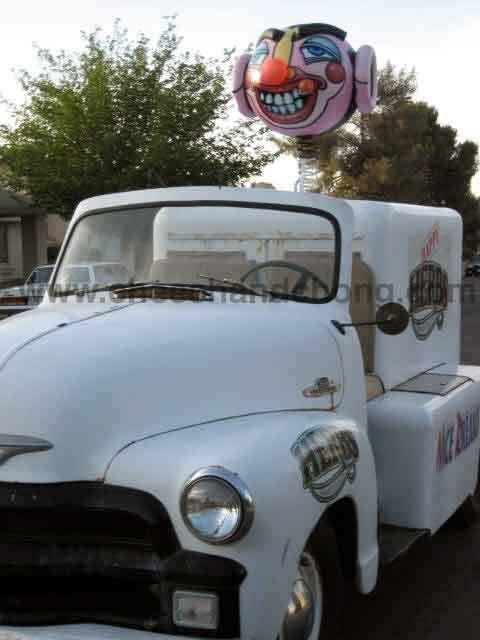 Thanks to Al from Fat Daddy's Ice Cream.This is first time the truck is being seen by the public. It will be on display April 5 - 7 at the Gold Coast Casino Rockabilly Car Show in Las Vegas. There will be a special benefit screening of Up In Smoke to raise money for the residents of apartments above the North End Diner. The apartments were destroyed by a fire this past March.